SKU: WD1315AP-BT3. 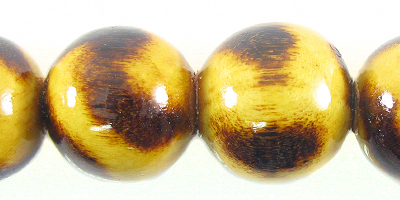 Categories: Beads & Pendants, Natural Beads, Painted Wood Beads, Wood Beads, Clearance. burnt wood round animal print 15mm. This is a 15mm round whitewood with burnt in design. Random swirly design created by burning. You will find a light laminate on each bead to enhance smoothness. A wonderful design to add to your animal print jewelry.